People make the case that playing at home does not make the biggest difference in the world, but in reality it does. During the regular season the Red Sox were 53-28 in Fenway Park, but only 44-37 when playing away from home. The Cardinals were 54-27 at Busch Stadium and 43-38 away from home. 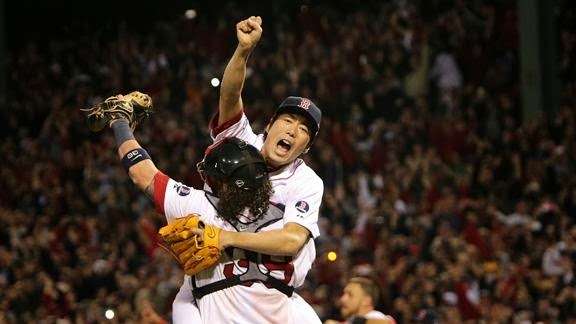 If the Red Sox were to lose Game 1 at home it would allow St. Louis to return home after Game 2 with the ability to not have to return to Boston. With both of these teams being so good at home, it may just come down to a Game 7 where each team has held their own turf and won their respective home games. If the Cardinals come out and defeat Jon Lester they will have a full head of steam when facing John Lackey in Game 2, and Michael Wacha will feed off of his teams offense. The Red Sox want to quickly jump on Wainwright and make him struggle, potentially getting into the head of Wacha and making him think about his start tomorrow, tonight. If the Sox are able to beat Wainwright tonight and make Wacha question his start tomorrow the Sox could be looking at a 2-0 series lead heading back to St. Louis. According to the image on the right, taken from the twitter account of ESPN, tonight's game is a big deal. With 21 of the last 25 winners of the World Series winning Game 1, it seems like the only more important game to win in the Fall Classic is the clinching game. In both 2004 and 2007 the Red Sox swept the World Series, starting off this years series with a win could spark the team to do what they did 9 and 6 years ago and bust out the brooms on Sunday. Now all of Red Sox Nation and the Red Sox must believe that they belong in the World Series, but do the St. Louis Cardinals? The Cardinals will be ready to play the Sox but they made a statement in Game 6 of the NLCS by crushing the Dodgers 9-0, while the Red Sox beat the Tigers 5-2. The Sox have proved that they have clutch hitting in the postseason but have been hitting the ball consistently. The Sox need to come out on offense and get base hits and score runs tonight off of Adam Wainwright to prove to the Cardinals that they prove that they belong. Game 1 starts at 8:07 tonight with the ball in Jon Lester's hand. Its time to go win Game 1, and win the rest of the series after tonight's business is dealt with.